Finding the perfect flooring product to complement your home is enjoyable when you shop with us, especially when you're on a budget. You want a material that not only looks good, but holds up well under daily foot traffic and the occasional spill. Our stylish collection of porcelain, ceramic, and stone flooring offers you the ideal options for flooring that is affordable, durable, and stunning. Stop by to explore our huge collection of tile flooring products, available in hundreds of colors and textures guaranteed to complement any interior design theme. Our local flooring gallery stocks a vast array of floor tiles engineered with quality and longevity in mind. We are dedicated to helping you find exactly the discount tile flooring you need to satisfy your aesthetic, budgetary, and performance needs. Why do so many area property owners prefer our tile floors? One reason is quality. Each multidimensional tile product we carry is designed to last for years to come. You're unlikely to find yourself shelling out for replacements when you bring home one of our flooring materials—in fact, you may be surprised at how well our products hold up in a busy household. Another benefit of this flooring is its affordability. Thanks to our buying power as a part of the national Flooring America buying group, our flooring showroom is fully stocked with a variety of cost-effective high-quality products. You always get the quality you need at a price point that fits your budget. A third benefit of tile flooring is the amazing versatility of the material itself. Tile is suitable for bedrooms, living rooms, hallways, kitchens, and bathrooms; plus, tile floors resist mildew, mold, water, fire, and frost. Wherever you need tile to work, it works for you. Plus, you can count on our experienced and skilled team to handle installation once you've chosen your preferred product. During the installation process, our contractors ensure your new product looks and performs as intended. We work quickly and carefully, checking our accuracy as we go; this means you can rest easy knowing you've invested in tile flooring services from a team that cares about your satisfaction. Don't trust an amateur with your home's beauty; instead, let a team with years of experience install your new tile floors. Ceramic Tile: A standby for property owners everywhere, traditional ceramic tile is the material of choice for construction, design, and remodeling contractors. It works well in kitchens and bathrooms, of course; however, more and more of our clients are using tile in their mudrooms, sunrooms, and other innovative areas. Your imagination is the limit when you choose ceramic. Porcelain Tile: Porcelain is very similar to ceramic; in fact, the manufacturing process for each is almost the same. However, this tile consists of much finer materials, which are fired at higher temperatures to produce a flooring product somewhat stronger than traditional ceramic. This makes porcelain an excellent choice for families that worry about accidents causing damage to their floors. 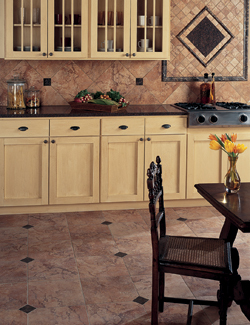 Stone Tile: Few materials rival the natural beauty, color, and texture of true stone flooring. No wonder this unique material is so popular with our clients - it comes in many different styles and brings the matchless elegance of nature into your home. Our flooring store carries many different types of stone tile products, each of which creates different atmospheres in different rooms. If you're not certain which of these products is right for your home, don't hesitate to ask for our experts' professional opinion. We're more than happy to assist you in making a wise decision for your home's atmosphere and your finances. Plus, we offer some of the industry’s best guarantees. If after living on your 4-Star or 5-Star rated floors for 30 days, you aren’t completely satisfied, we will replace them and even pay for the labor. Once you've settled on the right tile flooring material, it's time to start planning installation. Protect your investment with our professional installers. The longevity of your tile floors depends on the quality of the product and the installation, and the quality of your new floors could be compromised if they're not installed according to specifications. This could cost you more money in the long run. With that in mind, you can count on our tile flooring installation experts to add your latest flooring investments to your home – on your terms, and to your satisfaction. Our family-owned-and-operated showroom has been a Seattle fixture for more than two decades, and our clients are our friends and neighbors. It's easy to see why so many locals choose us for flooring products and services. Our flooring store hires only experienced and skilled laborers to oversee error-free installation. Rely on this team, which consists of hardworking contractors that work exclusively for us and are trained, certified, and background-checked. You can enjoy peace of mind knowing that only the finest professionals are working in your home. Contact us today to find out more about Seattle’s best selection of ceramic, stone, and porcelain tile floors. We proudly service clients throughout Seattle, Bellevue, Bothell, Edmonds, and Issaquah, Washington, plus the surrounding areas.